The Emir of Kano lives in a 15th-century palace within a walled 30-acre compound in the center of the city. As in Barth’s day, the compound’s high walls enclose the living quarters of the emir and his wives, concubines, and children, as well as reception halls, courts, forests, and grazing lands. 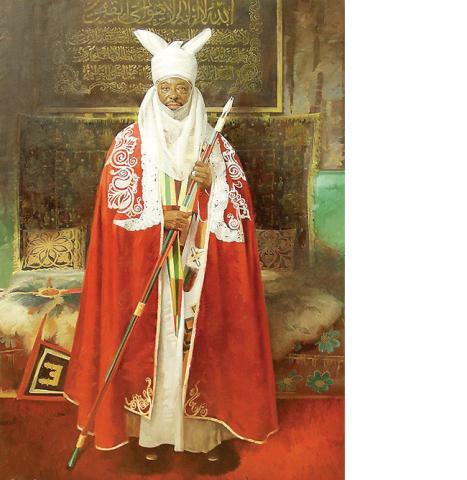 The current emir, Ado Bayero, has been on the throne since 1963. He is the direct descendant of the emir who accommodated Barth in 1851. Like his ancestor, Ado Bayero is the most important man in Kano. The first Emir of Kano was appointed by Usman dan Fodio, the Islamic scholar and revolutionary whose jihad in the first decade of the 19th-century against corrupt pagan rulers and slipshod Muslims transformed central Africa. Dan Fodio’s armies overran the region, and his crusade inspired jihads throughout greater Sudan. He built his new capital at Sokoto, still a major city in northern Nigeria. He divided his kingdom into 30 emirates. Most of the current emirs are direct descendants of dan Fodio’s original appointees. Likewise, the current Sultan of Sokoto, who is still considered the spiritual leader of Islamic northern Nigeria, is a direct descendant of dan Fodio. During business hours, the long tree-lined drive to the palace’s entrance is crowded with cars, soldiers, and men in glittering robes. Just inside the gate are attractive plazas flanked by courtrooms and galleries. The emir hears cases almost every day. One of my guides, Nasiru Wada, had grown up in the palace, because his father is the emir’s chief spiritual advisor. Now he and his young family had rooms at the rear of the palace, in the quarters of the royal slaves. I thought I had misheard. Royal slaves? In Barth’s time, all African rulers owned many slaves, but I assumed the system had been abolished. Nasiru asserted that royal slaves, as in the old days, enjoyed social prestige and were grateful to be under the emir’s care. No doubt true, but such benefits can’t justify the practice. Like many travelers to Islamic Africa, Barth noted that slaves there were treated relatively well compared to slaves in the West. They had certain rights and privileges. Some reached positions of power and became slave-owners themselves. A few children of royal slaves became kings. Still, it stunned me to find traces of this in modern Kano. Nasiru, a scholarly modern man who works in IT and drives a Corolla, took my surprise in stride. He pointed me to a study of the palace’s history and culture by Heidi J. Nast, now a professor at DePaul. Near the end of Concubines and Power: Five Hundred Years in a Northern Nigerian Palace (2005), Nast writes that the tradition of royal slaves and harems continues in Kano. (In addition to the four wives allowed by Islam, the emir has about 60 concubines, who enjoy the traditional prestige of their position.) Business relationships in Kano, notes Nast, are sometimes still cemented by the gift of a concubine. Barth would have recognized the gesture. This entry was posted in Uncategorized and tagged Ado Bayero, exploration, Heinrich Barth, Islam, Kano, Kano Emirate, Nigeria, Sokoto, Usman dan Fodio by Steve Kemper. Bookmark the permalink.